Quick overview: A tip for using Google Maps in conjunction with a written novel to enhance the student’s experience of a book. What does it do? 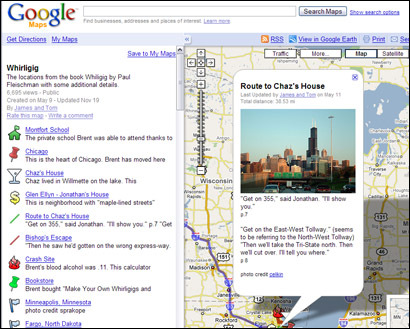 Google Maps (http://maps.google.com) is a website that allows your students to view satellite maps and roads throughout the world. An excerpt from the teacher’s website: The novel is Whirligig by Paul Fleischman- very powerful book that’s a quick read. It’s a great novel for this type of project (fiction but almost all real locations). The main character travels to the four corners of the U.S. (on a Greyhound Bus) as an act of atonement for killing a young girl in a DUI accident. I’ve got the main locations mapped (some real specific information in Chicago) as well as most of the route. It will continue to expand as the students progress through the novel. Now, what makes this useful? I figure you’ve got two options. You use it as a ancillary material to help get the students more involved in the novel. Let them explore the map and get them involved in explaining things and interacting with the information- otherwise it’s just a fancy map. You have the students add the information for the placemarks in Google Earth. Let them decide what is important at each location. This entry was posted in Tools and Apps and tagged google maps, novel. Bookmark the permalink.